When leaving the cinema screen for Finding Dory, there was one little nagging question that I couldn't get out of my head: how important, in a film, is originality? This then escalated further: how important, in a Pixar film, is originality? Pixar are widely recognised for their glimmering originality, a uniqueness that shines through in every film they offer. It's tough to imagine any other animation studio attempting anything as audacious as Wall-E or as innovative as Ratatouille. So, I think, originality is extremely important in a Pixar film. Efforts like Brave or The Good Dinosaur lack this originality and end up in the bottom tier of Pixar's pantheon, making it difficult to ignore the studio's need for fresh and exciting ideas. Ultimately, there's little originality to be found in Finding Dory. The film is packed with every Pixar trope you can name: lovable protagonists; quirky side characters; stunning animation; an emotional core, and themes relating to a journey. Finding Dory finds Pixar at their most by the books in a long time, yet this invites the one and only counter to the two questions that opened this review: if "by the books Pixar" is brilliant film making, is originality really as important as we think? Finding Dory picks up one year after the end of 2003's Finding Nemo, a film that remains one of the studio's greatest efforts even thirteen years later. After a brief flashback to Dory as a child with her family, we return to the present and find Dory (Ellen DeGeneres) helping Marlin (Albert Brooks) to raise Nemo, accompanying them on school trips. When one lesson discusses the idea of instinct and home, Dory remembers she has a family, and decides to set out and find them with Marlin and Nemo's help. Where Finding Nemo focuses on the physical journey of crossing an ocean to find someone you love, this sequel focuses on the more emotional journey of overcoming your disability to find those you care about. The result of this forces Finding Dory to feel like a smaller and more intimate film than its predecessor; we don't spend as much time in the wide and deep ocean here, as most of the film is confined to a Marine Life Institute. It's a smart move in order to set the two films apart and allow Finding Dory to stand on its own two feet, but it can't save the film from losing some of the magic and awe and wonder that made the original so breathtaking. That said, this smaller scale has no impact on the film's characters, both lead and supporting. 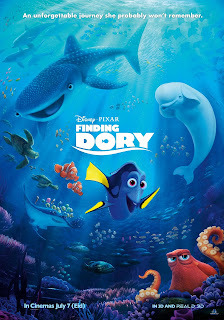 Dory remains as lovable a protagonist as ever, and DeGeneres' vocal performance is arguably stronger here than it was thirteen years ago. Dory is given much more meatier material this time around, and thus DeGeneres has more to work with. She nails the one liners, and her vocal tone whenever Dory forgets something is pitch perfect, but it's the softer and more emotional moments in which DeGeneres truly shines. Albert Brooks is also good as Marlin, a slightly grouchier character than the last time we saw him, but an enjoyable on screen presence nonetheless. The supporting characters may not feel as inspired as last time, but each and every one remains enjoyable. Ed O'Neill gives a terrific performance as Hank, a seven tentacled octopus, but it's his mannerisms and movements that give him the variety of his laughs. Ty Burrell is also consistently funny as Bailey (a Beluga whale who believes he can no longer echo-locate), and Idres Elba and Dominic West give gleefully fun performances as two sea lions that never want to leave their favourite rock. The film is loaded with great vocal performances that bring to life fun and welcoming supporting characters, the kind of characters that only Pixar know how to write. Where else this more intimate scale benefits the film, though, is in its story and its emotional core. The narrative of Dory searching for her parents could have expanded across an entire ocean again, but by relocating the characters to one institute, a number of things are immediately achieved. There's a sense of real narrative progression very early on, as the film flies along at a zippy pace without stalling for the sake of it. There's the fact that it allows the film to attempt all kinds of comedy that Finding Nemo couldn't (Sigourney Weaver's moments are particularly inspired, and easily some of the film's biggest laughs). But, mostly, it allows the emotional core of the film to feel wonderfully focused. There's no mistaking that this is Dory's journey, and the tight focus of the film allows us to really understand how much this means to her. Finding Dory's intelligent use of flashbacks reinforces this further, as we grow to see the life she lived before she was separated from her family. The film's script understands its characters and it understands the paths these characters need to go on in order for the film to be fulfilling, yet it's never content on taking the easy option or the predictable route. There are perhaps a few too many narrative beats that come straight out of its predecessor, but for the most part Finding Dory is content on telling its own story. The delicacy of Finding Dory's storytelling is truly something to behold. The film takes on emotional subject matter, but does this topic justice by never shying away from the reality of it. Short term memory loss is a difficult condition to imagine, and through its intricate flashbacks the film shows us the upsetting effect this can have on those around someone who suffers from it. There are a number of emotional sequences in the film, most of which come from watching a young Dory's parents finding joy and excitement in their family. By telling two stories simultaneously (the story of how Dory loses her family as well as the story of how she finds them again) the film has the ability to balance two completely opposing emotional cores, and writer/director Andrew Stanton knocks it out of the park. The film balances these two stories seamlessly, and it succeeds in crafting two very different kinds of emotion. The film's focus on Dory's condition works wonders, as we see characters reacting to her in a variety of ways: we see love, we see endearment, we see confusion, we see anger and we see upset. It's a testament to the film's screenplay and storytelling that all of these angles come to the surface in such a controlled and delicate manner in a film that barely surpasses the ninety minute mark. It is mildly frustrating that the film doesn't feel as fresh and exciting as it could, but it also works well in its favour. Within minutes Finding Dory has perfectly recaptured the tone and atmosphere of its predecessor, and there's no debating whether or not this feels like trademark Pixar through and through. Perhaps more could have been done to allow this story to detach just a bit more from Finding Nemo, but sometimes familiarity comes hand in hand with reliability. I was pretty confident that I would enjoy Finding Dory, but within minutes of the film opening I knew I was going to adore it. And that I did. Finding Dory may not have the emotional wallop of Inside Out or the inventiveness of the Toy Story series or the bravery of Wall-E, but what it does have is this warm and fuzzy feeling that didn't leave me for hours after the credits rolled. Here, Pixar have given us a hearty and welcoming sequel that has a firm grasp on its characters, and always puts them ahead of the jokes and plot twists. The story could go in any direction, but I would feel confident that the film would pull it off. That's what makes Finding Dory such an enjoyable piece of film making. You feel like you're in safe hands just from the opening frame, and it's a feeling that never fades away. To Summarise: Consistently funny, delicately told, and filled with heart and soul, Finding Dory builds on its predecessor's triumphs in a near perfect manner in the ways that only Pixar know how.